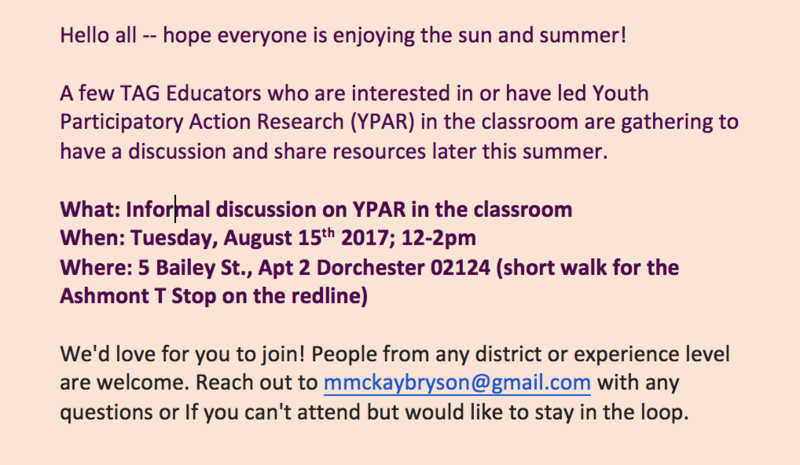 ***IMPORTANT*** Due to the predicted weather tomorrow (Wed., Aug 22), we have moved this event inside to the Boston Teachers Union Hall (180 Mt. Vernon Street, Dorchester, MA 02125). The event will still be held tomorrow, Wednesday, Aug. 22, and doors to the BTU Hall will open at 5PM with the film, “Dawnland”, showing at approximately 7pm. We’re thrilled to have two of the filmmakers introducing the film, Mishy Lesser and Adam Mazo. Free pizza will be served but feel free to bring a potluck dish (no obligation, of course). Invite others through the Facebook event. 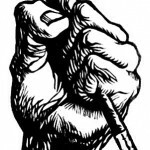 We’re holding our next planning meeting for the 2018 Annual Boston-area Educators for Social Justice (BESJ) Conference next Wednesday (2/7) from 4:30-6:30 at Fenway High School (2018 host). Open to all, including youth. We hope to see you there! We’re holding our next planning meeting for the 2018 Annual Boston-area Educators for Social Justice (BESJ) Conference next Wednesday (1/10) from 4:30-6:30 at Fenway High School (2018 host). Open to all, including youth. We hope to see you there! 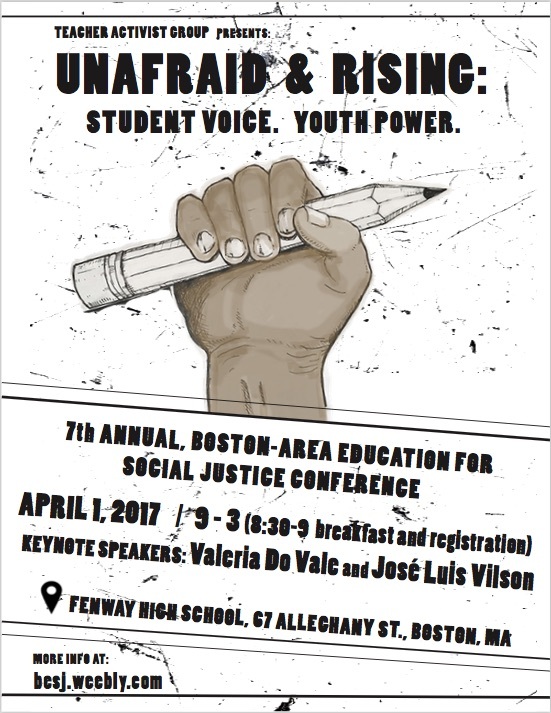 7th annual Boston-area Education for Social Justice Conference on April 1!